First piece of Christmas crafting down. I've had this idea buzzing around for a few weeks, and then of course saw a similar one in this months issue of this magazine and I'm sure many other places too - so much for originality! But it was the perfect thing to do, sitting in front of the tv last night. I just threaded some blue, red and white wool felt on to a long piece of florists wire along with various red buttons. Then twisted the ends together and added a piece of ribbon, to hide the fact that it's stuck on with blue tack! I want to make a large version, but I'm such a tight wad when it comes to using up my precious wool felt and even these small ones use far more than you would think. Of course the great thing is that you can use all those tiny bits that you just won't throw away and finally feel completely justified in keeping them. Bonus. I also found that the easiest way to thread the felt was to poke a small hole through it first with a needle - but if you use craft felt instead of wool felt, I don't think you'd need to. 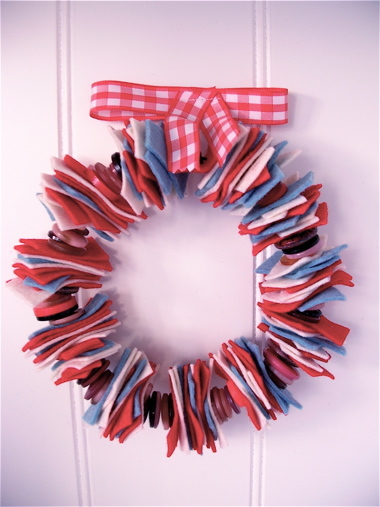 After making this one I thought I'd have a go at something that might be a little quicker and made a small rag wreath too. This one was made by simply tying strips of fabric to the florists wire and adding a few squares of wool felt every few pieces to give it a bit of depth and pad it out. 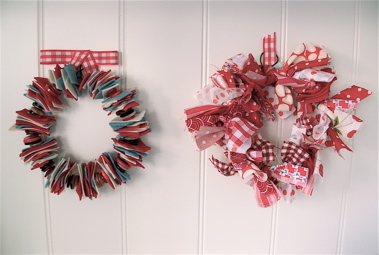 I'm not quite as happy with the rag wreath, but I do love the fact that it again uses the scraps that you can't throw away. It's also a really quick project. Both of which means that I'm definitely going to make a much bigger version. Possibly even tonight. Because I don't have work to do. 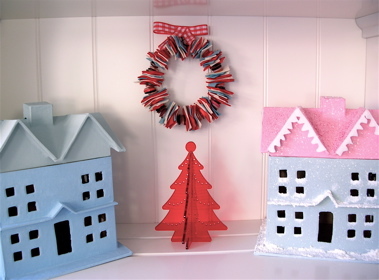 Of course I've still got these little houses to finish (I bought them as paper mache blanks) and a wintery scene to create, so maybe I'll do that instead. Oh the pressure.